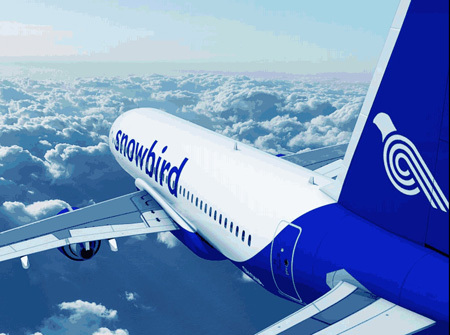 Snowbird Airlines Ltd (Helsinki) is a new Finnish charter airline. The company will focus on serving the needs of tour operators and travel agencies and intends to operate flights to Egypt, Turkey, Greece and the other parts of the Mediterranean from Finland. However the new airline is taking a new approach. The company wants to display Finnish products and invites Finnish businesses and designers to showcase their products. The attractive logo was designed by Sami Wirkkala and will have a Finnish sister brand of “lumilintu” (Snowbird in Finnish). The new airline plans to launch operations this summer with a single Airbus A320. All images by Snowbird Airlines. This entry was posted in Snowbird Airlines and tagged A320, A320-200, Airbus, Airbus A320, Airbus A320-200, Snowbird, Snowbird Airlines, Snowbird Airlines Ltd on March 20, 2014 by Bruce Drum.